Responses from 30,000 large-company plants* to a 16-question survey about their manufacturing management practices were analyzed by researchers from the Census Bureau, Stanford, and MIT. The questions, related to what the (Census Bureau) researchers are calling “structured management practices,” fit into current lean thinking. Researchers say they are based on continuous monitoring, evaluation, and improvement practices, and were selected from current lean manufacturing principles. I think that the questions were useful in assessing the state of a company in using continuous improvement and lean, perhaps not exactly as we would write them, but close enough to make the data gathered meaningful. With the data collected, researchers came up with a management score for the plants' intensity of use of the practices investigated. These management scores were compared to data on company performance. Did the companies with stronger scores make more money? That’s what people really want to know - are lean companies more profitable? The answer is yes, a lot more. 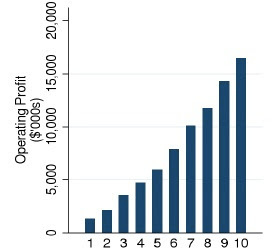 Companies with the highest scores on using management practices associated with lean were much more profitable, as this graph shows. There’s a lot more to the report and the study that I’ll talk about in the next few days. I just wanted to share the news that we can finally begin to base our ideas about the value of lean on some hard data, objectively collected, analyzed with the highest level of statistical rigor. Read the Census Bureau press release, with links to questions and research report. This is not a Census Bureau survey and has not been through the usual Census Bureau review process. It is the findings and opinions of the research team. The Census Bureau is simply making it available because it expands on their data. The report details indicate that a high level of statistical rigor was applied by the research team. * The sample used for the survey was limited to large companies. Because of some estimating processes used in the ASM data for small and medium sized businesses, they were omitted from the survey. That's a disappointment since so many of our practitioners are from such companies. I have not yet found the criteria for calling a business small or medium. Value added - This measure of manufacturing activity is derived by subtracting the cost of materials, supplies, containers, fuel, purchased electricity, and contract work from the value of shipments (products manufactured plus receipts for services rendered). The result of this calculation is adjusted by the addition of value added by merchandising operations (i.e., the difference between the sales value and the cost of merchandise sold without further manufacture, processing, or assembly) plus the net change in finished goods and work-in-process between the beginning- and end-of-year inventories. For those industries where value of production is collected instead of value of shipments, value added is adjusted only for the change in work-in-process inventories between the beginning and end of year. For those industries where value of work done is collected, the value added does not include an adjustment for the change in finished goods or work-in-process inventories. “Value added” avoids the duplication in the figure for value of shipments that results from the use of products of some establishments as materials by others. Value added is considered to be the best value measure available for comparing the relative economic importance of manufacturing among industries and geographic areas. Value of product shipments - Includes the total value of all products produced and shipped by all producers, not just those with values of $100,000 or more. However, for selected products, this can represent value of receipts, value of production, or value of work done. Industries that are published on these unique basis are separately. This comment is from Dan McDonnell: This is good but I am often leery about statistical manipulations that can actually create more cynics than believers. Intuitively and from experience I believe a survey likely this likely drew a correlation between intensity of lean mgmt. and profitability. However the data provided here shows only amount of profits on the Y axis. It is possible that the survey had larger companies studied that had higher lean intensity and smaller companies studied with lower and the graph could look like this and prove nothing. I would rather have seen data that showed operating income % on the Y axis or better yet the change in operating income percent over a 5 year period correlated to level of lean mgmt. intensity. Let's look more deeply into the data published so far in the coming weeks and stay in touch with the U.S. Census Bureau to get future reports. I'm sending you the full PDF of this first report.